A Merry Samhain To All! The Celtic New Year is here,and I wanted to wish one & all a very Merry Samhain. I'm home,will be carving my jack o lantern & honoring ancestors. This morning I was greeted with a very heavy fog. Others in the Northeast got a sudden snow. I'll be paying attention to my intuition,to see what sudden flashes of insight I get,and am hoping for a beautiful waxing moon this evening. There's nothing like growing your own veggies-I'm shocked at how much I appreciate picking a homegrown bell pepper & using it in my cooking. I've seen for myself just how long it takes a pepper to get to maturity-and in seeing the time it takes,the nurturing you put into growing it,to the end result. You appreciate it because you know the time it took to get there-and that's far more than I ever did buying veggies at my local grocery store! I'm still using my bread maker-tho it still overflowed at the top and I used it in cool weather-I'm wondering if they are having me use too much yeast. I'm picking up what I need to make pumpkin bread since the oven has went kaput. I also picked up the book 300 recipes for your bread making machine,and there's sooo many different breads you can make. I'm going to be a busy bee this winter! 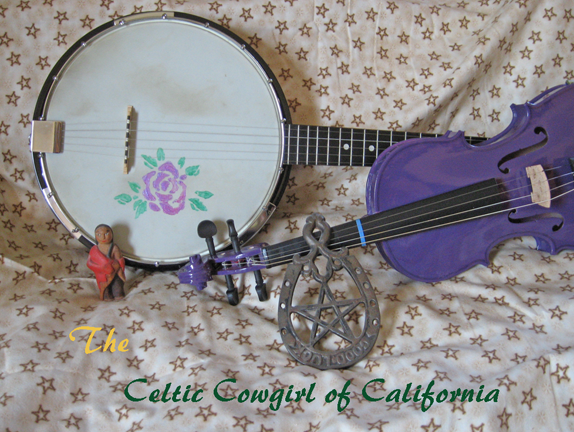 Musically I'm playing more uke,Irish tenor banjo & mandolin-Yule tunes,in addition to old time ditties like LIberty & Angeline the Baker.